This dish was delicious. (I wish it photographed better). Heat 3-4 quarts of water. Boil the potatoes until soft and can be poked through easily with a fork. Drain. Put potatoes in a large bowl. Add mayonnaise, butter, cumin and salt to taste. Mash potatoes with a masher (or with a large fork) until it becomes lumpy. In a skillet over medium-high heat saute shallot, garlic and squash until it turns golden brown about 3-4 minutes. Set aside. To make the cream sauce: In a large skillet over medium-high heat add heavy whipping cream and 1/2 cup Chardonnay. First reduction 10 minutes Second reduction add 1/4 cup Chardonnay and reduce another 10 minutes. In a 9 x 13 baking dish spread potatoes as bottom layer. Top with squash saute and fish and press into potato. Pour cream sauce on top. Bake dish uncovered for 25 minutes. Serve with buttered toasted baguette or Italian bread. This dish was inspired by http://cozyisalifestyle.wordpress.com/2012/03/20/easy-but-fancy-fish-casserole/. I think your photography is fine – I find it really hard to photograph my dishes with my little samsung! Nice recipe though, I’ll be saving this one! Thank you Gemma. Your photos look good too! I use my Droid phone. Your fish casserole sounds great. Some meals are always way better than they look. It is impossible to get a good photo of some dishes. It kind of reminds of a Shepherd’s pie with fish. Have to try it out. 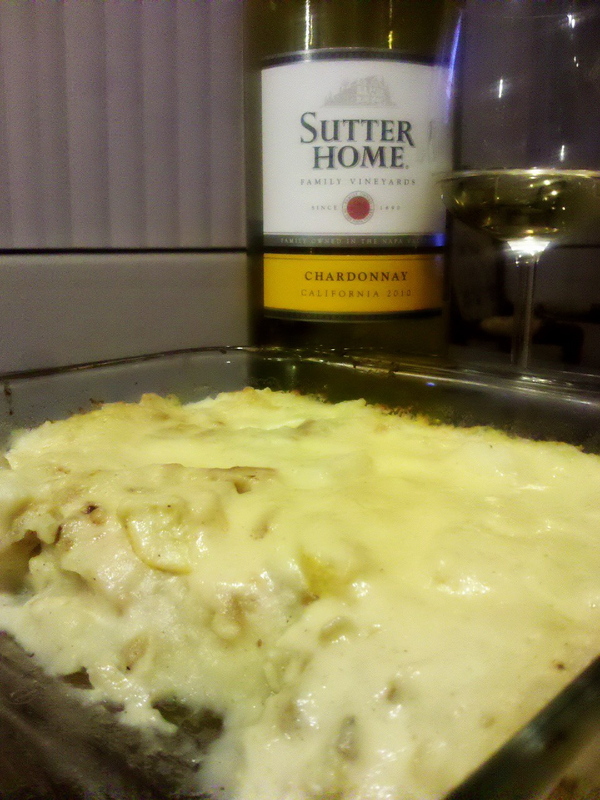 A lovely fish casserole and once you´ve opened that wine…well, it would be rude not to have a few slurps!